Lombardy has so much to offer to tourists. There is Milan , the commercial and fashion capital of Italy, the attractive Lake Disrict, and centers for winter sports and summer recreation. For history buffs, Lombardy had an eventful past, having been overrun by Austrian, French and German invaders. Lombardy ski resorts were the site of the Winter 2006 Olympic Games. The ski slopes are located at Bormi , Ponte di Legno , Aprica , Livigno , Passo del Tonale and Valdidentro. Let's not forget the superb Lombardy wines.The major wine producing areas are Valtellina near the Swiss border, Oltrepò Pavese south of Milan, and Franciacorta in the Province of Brescia, famous for its sparkling wines. Then there are the delicious cheeses Taleggio, Gorgonzola and Quartirolo. 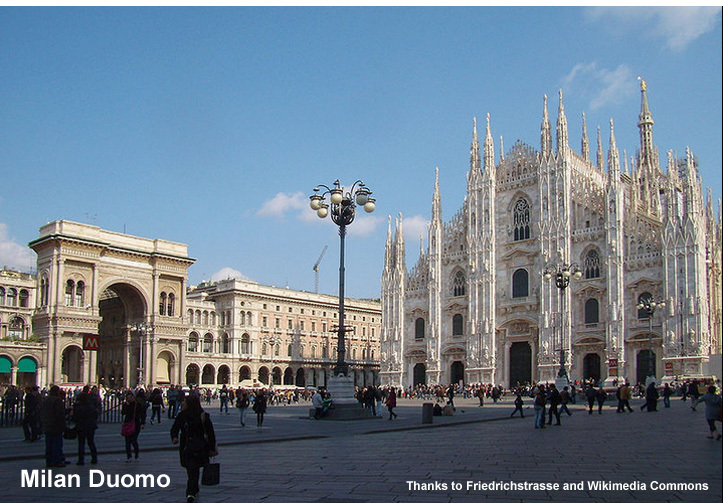 The Wikitravel Guide presents an informative picture of what Milan is all about. Autostradas A1, A4, A7 , A8, A9 and A53 converge on Milan and provide access by car from all directions. Milan's primary airport is Malpensa (MXP),40km northwest from the center of the city. The secondary airport is Linate (LIN), close to the city.There are railroad and bus connections between Malpensa and Milan.